This week we take a look at the lineage of the Campbell surname as it pertains to my husband’s family history. Henry Campbell died on 26 Jan 1873 in Waverly, Cheboygan, Michigan. Henry’s son Walter Henry Campbell is my husband’s 2nd great-grandfather. 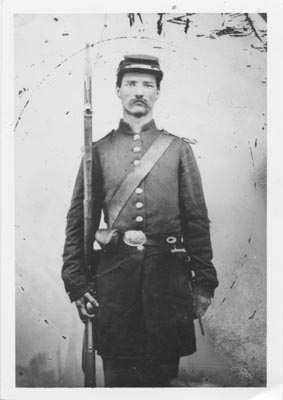 Walter served in the Civil War as a Private in the Union Army, Company G, 13th Michigan Infantry. Campbell, Walter H., Waverly. Enlisted in company G, Thirteenth Infantry, Aug. 29, 1864, at Kalamazoo, for 1 year, age 19. Mustered Sept. 1, 1864. Discharged at New York City May 26, 1865. Campbell, Willard N., or William, Waverly. Enlisted in company G, Thirteenth Infantry, Aug. 29, 1864, at Kalamazoo, for 1 year, age 21. Mustered Sept. 1, 1864. Sick at Goldsboro, N. C. April 8, 1865. No further record. Search for Walter Henry Campbell’s Civil War Pension files. Find additional sources for Henry’s birth year (1821 vs. 1803 or 1800). Find the parents and siblings of Henry Campbell and Ruth Newcombe. Check out my Ancestry Family Tree for Henry Campbell and his wife Ruth Newcombe. See the Find A Grave Memorial for Walter Henry Campbell. Read about the Michigan Volunteers in the Civil War. This week we take a look at the lineage of the Root surname as it pertains to my husband’s family history. Other than locating a few Census records and typing up a sketch passed down through the family, I have not researched this line in detail. My husband’s 3rd great-grandfather was Frederick Franklin Root, born in either 1800 or 1803 in Greenville, Greene County, New York (depending on the source you believe). His parents were Asa Root and Lorena Judson. A full detail of his life and family can be found in the sketch below. The following sketch was authored by the children of Frederick and Rachel Root in the early 1900’s. It seems meet for us that we should write a chronicle, and preserve for posterity an individual history of our ancestors. Frederick Franklin Root was the son of Asa Root and Lorena (Judson) Root, and began life in Greenville, N.Y. of the 10th of Sept. 1800, thus passing his life in an epoch of wonderful industrial advancement. He spent the First 15 years of his life in Green Co. N.Y. and after the death of his parents, he with the rest of his family moved to Tioga Co. N.Y., which was then wild and mountainous, living with an older sister, Mrs. Obedience Pierce and her husband Franklin Pierce. At the age of 16 years he met with a serious accident while engaged in making maple sugar he fell into the fire, having fainted from overwork, loss of sleep and exhaustion, and was so seriously burned that his right arm was amputated below the elbow. Full of courage, he took up the duties of life with a strong heart although seriously handicapped he managed to accomplish as much with one hand as most men do with two, and there was no kind of work too difficult for him to attempt. He was noted for his wonderful fetes of strength and activity. The time passed by this family, living in the nineteenth century, constitutes a link between the old pioneer days and the later era of opulent prosperity and manifold advantages. We of today can scarcely conceive of the conditions of things one hundred years ago when Frederick Root was a young man- no railroads, no telegraphs, no telephones, wireless systems, mowers, binders or other farm machinery found on the farms in the first part of the twentieth century. We (his children) recall the stories related by him about the hand sickle for harvesting wheat, the scythe for mowing hay, and the many primitive implements in use in his day, and we can but wonder how they would serve our needs in this twentieth century. After living in southern New York for some time he again moved, taking up his residence at Lawrence, Tioga Co. Pennsylvania. Somehow this was the finest town he had ever struck-the soil was so rich, the birds so beautiful and the trees so fine and stately. Was it all these? Or was it! Alas? There was a maiden in Lawrence (and she was called the handsomest girl in the Susquehana River) that captured his affections. Her name was Rachel Malvina Stewart. They soon agreed to share the burdens of life and on the 9th of Oct. 1842 they were married. They lived in Lawrence seven years, then in 1849 thinking it was better farther on, he took his family northward to the Erie canal and going by boat to Detroit and Kalamazoo which was at that time the western end of the Michigan Central Railroad. He located on a farm 8 miles northwest of Kalamazoo in the township of Oshtemo. He was a sure shot and a successful hunter and took a keep delight in his ability to surpass the younger man in marksmanship even after old age and failing vision had overtaken him. The writer recalls when a mere child seeing him drive a nail that was marked with chalk on the head to make it visible at a distance of ten rods. He was then 75 years old. After the death of his wife in 1879 he sold his farm and spent his remaining years with his daughter, Mrs. Abner Oakes Green and died at the ripe old age of eighty-six at Kendall, Van Buren Co. Mich. March 30th, 1886. Frederick F. Root and Rachel M. Stewart were married at Lawrence, Tioga Co. Pa. Oct 9th, 1842. Check out my Ancestry Family Tree for Frederick Franklin Root. See the Find A Grave Memorial for Marion Dearborn (Root Forbes) Green. 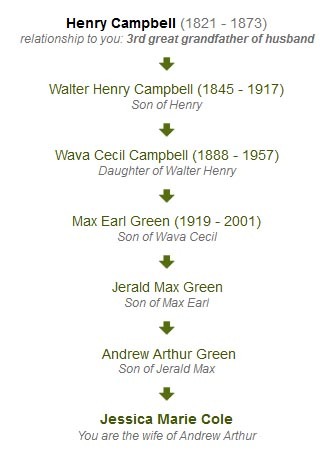 This week we take a look at the lineage of the Green surname as it pertains to my husband’s family history. The Green name belongs to that of my husband, which I proudly accepted upon our marriage in 2002. I have been researching his family line along with my own for the past decade. It has been a very strong focus of my research. 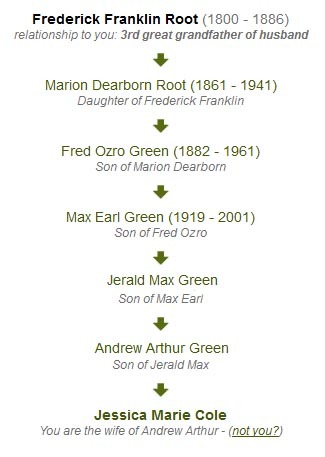 The Green family lineage is controversial amongst the many genealogists currently researching it. I offer the following information as a loose translation to a puzzle that is still being actively researched and debated. Nahum Green, my husband’s 5th great grandfather, was born 10 Apr 1729 in Leicester, Worcester, Massachusetts. His wife was Dorcus Sanger, born 01 May 1732 in Woodstock, Windham, Connecticut. The couple had eight children: Pamela Green, Zariah Green, Zevirah Green, Jeraiah Green, Amasa Green, Jared Green, Nahum Green and my husband’s 4th great-grandfather Cyril Green. Nahum died on 29 Jul 1775 in Royalston, Worcester, Massachusetts. His wife Dorcus died in 1773 in Royalston, Worcester, Massachusetts. 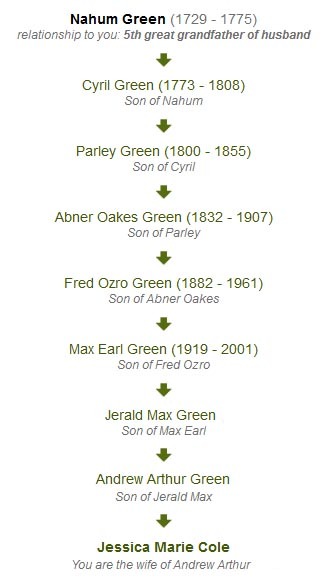 A majority of my research on the Green family lineage has focused on my husband’s third great-grandfather, Abner Oakes Green. Abner was born 08 Feb 1832 in Mumford, Monroe County, New York. He served as a Union soldier in the Civil War, and I am incredibly proud of his service to our country. Abner Oakes Green was born in Mumford, Monroe Co. N.Y. and was one of a family of eight children. Abner’s father was Parley Green, who was born in 1800 in Shaftsbury, Bennington Co, Vermont or Washington Co, New York. The two county lines were blurred during this time, and no true record exists for his birth. Parley died in 1855 in Monroe County, New York. Abner’s mother was Maria Oakes, whose maiden name he was given as his middle name. Maria was born 09 Jun 1802 in Bradford, Orange, Vermont. I’m not sure when and where she died. Had many disadvantages as a child, receiving only a common school education. When young he served a three year apprenticement, learning the wagon makers trade and also worked in a machine shop. He helped to build one of the first wheat separators put out by Mr. David Nichols (later of the firm of Nichols and Shepherd). When Uncle Sam called for volunteers he was one of the first in his town to offer his services and enlisted as a private in Co. C fourth N.Y. Heavy Artillery in September 1861 and served till the close of the war. He was married to Augusta Smith 26 December 1866 and to this union was born three children: Julia Green (1867 – ? ), Milton A. Green (1869 – 1936) and Charles R. Green (1871-1888). Augusta was born in 1838 in New York and died June 22, 1876. After his first wife Augusta died, Abner married Marion Dearborn Root in Paw Paw, Van Buren, Michigan on 07 November 1880. Marion Dearborn Root was born 28 Jan 1861 in Oshtemo, Kalamazoo, Michigan. To this union was born six more children: my husband’s 3rd great-grandfather Fred Ozro Green (1882 – 1961), Stephen Zit Green (1885 – 1970), Joe Green (1887 – 1887), Rachel Nell Green (1888 – 1973), Frances May Green (1891 – 1958), John Louis Green (1893 – 1972). Death separated the two when Abner Oakes Green passed away on 31 May 1907 in Kendall, Pine Grove Township, Van Buren County, Michigan. He is buried in the Kendall Cemetery with a military headstone indicating his service in the Civil War. Marion later remarried to John Caleb Forbes on 23 December 1913. Marion Forbes died on 06 Aug 1941 in Kalamazoo, Michigan. She is also buried in Kendall Cemetery, Pine Grove Township, Section A, Row 3, Lot 12. I have a few hundred pages of pension and medical documents from Abner’s service in the Civil War. Some day I would like to digitize them and post them for others to see. I would like to research the family of Nahum and Dorcus more thoroughly. I need to find out when and where Maria Oakes Green died. Check out my Ancestry Family Tree for Abner Oakes Green. I manage a public Google Doc on the Green Family Parentage. There are dozens of source references and debated facts listed, along with the thought process behind the current research. See the Find A Grave Memorial for Abner Oakes Green, and link to graves of his family members. This week we take a look at the lineage of the Yach or Jach surname as it pertains to my family’s history. I know almost nothing about this family line. Mary Yach, also known as Marianna Szulfer Jach, may have been born in Klukowo Huta, Kartuzy, Prussian, Poland in 1840. I haven’t done enough research myself on her to know for sure, but it seems researcher Susan Chapman has. 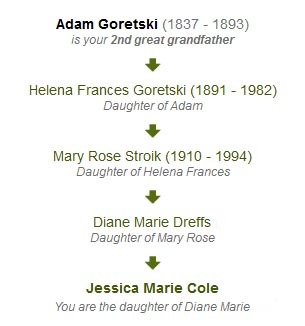 The only thing I know about my 2nd great-grandmother Mary for sure is that she married my 2nd-great-grandfather Adam Goretski (aka Gorecki) circa 1864 presumably in Poland before immigrating to the USA in 1866 or 1868. She and her husband Adam had about 15 children, many of which died young. After her first husband Adam died, Mary remarried a man named Ignac Betker (aka Nick). She and Nick lived together until his death in 1912. Mary died sometime after 1920, presumably in Portage County, Wisconsin. I have been told she is buried with her second husband Ignace in St. Adalbert’s Cemetery in Alban, Wisconsin. I don’t have any of the vital records for Mary Yach, nor many of the important historical records. I have not researched her family line at all. Check out my Ancestry Family Tree for Mary Yach. See the memorial for Mary’s second husband Ignac Betker on Find A Grave. Look at the research for the Jach family completed by Susan Chapman. This week we take a look at the lineage of the Goretski and Gorski surnames as they pertain to my family’s history. I have seen this surname spelled as variants of Goretski and Gorski throughout my research. It is not clear to me what it originated as in Poland. 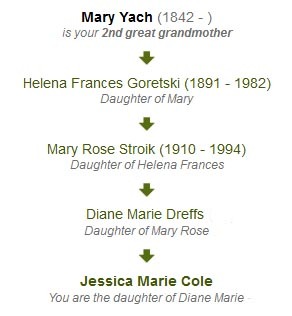 It seems some of the family still carries the name Goretski while other branches, such as with my great-grandmother Helen Frances Gorski, changed the name sometime in the early 1900’s. My 2nd great grandfather, Adam Goretski, was born in Prussia, Poland. His birth year is unclear and it may have been as early as 1828 or as late as 1837, depending on the source. It seems that he may have immigrated to America in June 1866, according to a Petition for Naturalization dated January 4, 1874 that might be his. It is indexed as Adam Goritzki, and I will order a copy to see if it matches his family details. According to other researchers, Adam Goretski died on March 1, 1893 in the Town of Sharon, Portage County, Wisconsin. I have no proof of his death date or his burial, and I could not find an obituary in Portage County to support this date. Along with his wife Mary Yach/Jach, we believe Adam had ten children: Martha, Joseph, Rozalje, John, Agatha, Antonia, August, Toefil (aka Charles), Alexander, and my great-grandmother Helena Frances Goretski. Adam died at age 56 when his youngest daughter was less than 2 years old. He is buried in Sacred Heart Cemetery in Polonia. Adam Goretzki is listed as a defendant in a criminal court case brought against him by the State of Wisconsin. 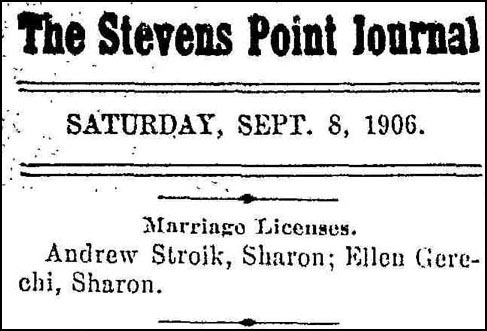 You can see the case entry published in the Stevens Point Daily Journal on February 20, 1886 on Page 7. I was not able to find any further details about the case in the newspapers, so I need to contact the courts in Wisconsin to see if there is additional information available. Adam and Mary Goretzki are listed in the 1880 US Census in Sharon, Portage, Wisconsin (ED143, Sheet 27, Line 28). Adam Gorecki is listed in a store ledger as a customer in Stevens Point. The well-known article documents a list of residents of the town in the 1880’s and 1890’s. I do not have any of the immigration details for Adam Goretski. There is a Soundex Index card for Adam Goritzki who came to the USA in June 1866 via the port of Baltimore and filed a Petition for Naturalization in Stevens Point, Wisconsin on January 4, 1874. I will request a copy to see if it might be him. I do not have any details on the marriage of Adam and Mary. Much of the information I have came from interviews my DaD did with Helen Stroik in the early 1980’s before she died. The rest of it came from contact with two Goretski researchers, Mary Stutzman and Amy Goretski, in 2002. Check out my Ancestry Family Tree for Adam Goretski. See the Find A Grave memorial for Adam Goretski. This week we take a look at the lineage of the Gerszewski surname as it pertains to my family’s history. I haven’t had much luck with this line either. Mary Gerszewski, my 2nd great-grandmother, was born in September of 1847 in Lippuschutte, Poland. The 1900 US Census shows she arrived in the United States in 1868, which is the same year she says she married Frank Stroik (1835 – 1918). 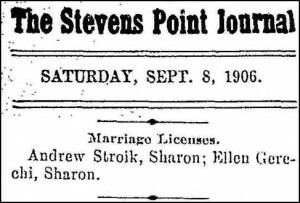 Mary and her husband Frank Stroik had approximately seven children, all of whom were born in Wisconsin I believe in the Stevens Point area. They children were: John (1871 – ? ), Teophil or Francis (1873 – ? ), Anna (1875 – ? ), my great-grandfather Andrew Anton Stroik (1876 – 1929), Anastacia (1877 – ? ), Johnie C (1884 – ? ), Nicholas (1886 – ?) and Ladislaus (aka Landie or Walter) Joseph Stroik 1890 – ?). Mary died on February 15, 1930 in Wisconsin, probably in or near Stevens Point. I don’t know who Mary’s parents were, nor any of her siblings. I don’t know where she and Frank are buried, or anything about her immigration or naturalization. If you can help me track down any information about this Gerszewski family, I would love for you to leave a comment below. Any assistance would be appreciated. See the family of Mary (Gerszewski) Stroik in the 1880 US Census and the 1900 US Census. Check out my Ancestry Family Tree for Mary Gerszewski. There are currently 106 Gerszewski family members listed on Find A Grave. Unfortunately, at this time I don’t think Mary is one of them. None of them are in Wisconsin. 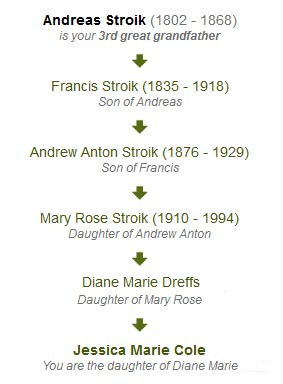 This week we take a look at the lineage of the Stroik surname as it pertains to my family’s history. 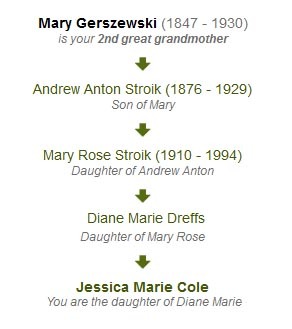 My 3rd great grandfather was Andreas Stroik. Andreas was born around 1802 in either Lipusz, Prussia or Gandsk/Danzig, Poland. He married a woman named Marianna Pellowski (or Pelowska) around 1824, based on the birth years of all of their children. We don’t have their marriage record nor we have their immigration records. Victoria (1825 – 1917), Dorothy (1828 – 1914), Andreas (1831 – 1832), Mariana (1833 – 1898), my 2nd great-grandfather Francis Stroik (1835 – 1918), Magdalene (1836 – 1916), Rosalia Julianna (1837 – 1837), Albert (1840 – 1841), Josephine (1842 – 1862), Joseph (1843 – 1919), Christoph (1845 – 1915), John M (1849 – 1920) and little Elizabeth Stroik (1852 – 1852). 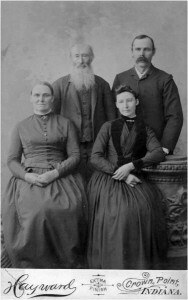 All 13 of their children were born in Prussia, Poland so I believe they immigrated to the United States sometime after 1852. Andreas died on 26 Jan 1868 in Sharon, Portage, Wisconsin. The Stroik families have led very, shall we say, productive lives? Andreas and Mariann had 13 children. Their son Frances and his wife Mary had at least 7 children, although I am sure I haven’t found them all yet. Frank and Mary’s son, my great-grandfather Andrew Anton Stroik and his wife Helen Goretski had 11 children, including a set of twins. Their daughter, my grandmother Mary Rose Stroik had 16 children including three sets of twins. 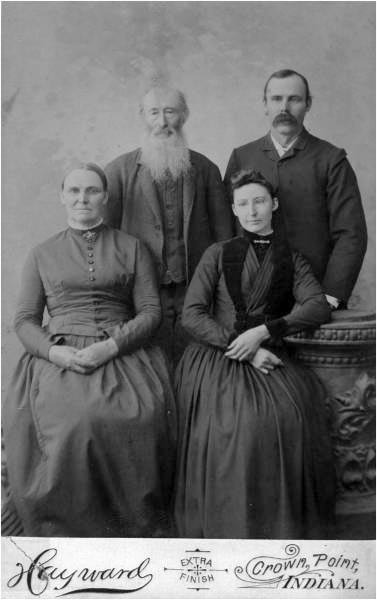 Andreas and Mariann Stroik have hundreds of descendants in the United States today. Check out my Ancestry Family Tree for Andreas Stroik. See the grave of Andrew Anton Stroik on Find A Grave. This week we take a look at the lineage of the Kozminska surname as it pertains to my family’s history. This is by far the tiniest little tree in the history of family trees. It reminds of the tree in A Charlie Brown Christmas. My great-grandmother, Anna Kozminska, was born in Poland on April 26, 1867. Her maiden name may have been Kozminska, Kozminski, Kozmanski or Buzinski. Her first name has also been documented as Annie instead of Anna. Various records have indicated multiple possibilities, although I have seen references to “Kozminska” more than any other variation. Anna arrived to the United States in 1891 according to the 1900 US Census, in 1889 according to the 1910 US Census and in 1888 according to the 1920 US Census. All of the census records show her living in Otsego County, Michigan in the Gaylord area. The 1900 US Census says she had been married for 14 years, putting her wedding date circa 1886 prior to her arrival. Unfortunately, I haven’t found Anna’s or Joseph Dreffs’ ship passenger records. We know absolutely nothing about her family. Anna died on April 8, 1926 in Saginaw, Michigan. Her son (my grandfather) Walter Anthony Dreffs was 26 years old when she passed away. She died more than two decades before my mother was even born. We have no other information about her. She is buried with her husband Joseph Dreffs at Mt. Olivet Cemetery in Saginaw, Michigan. Mrs. Joe Dreffs, a resident of Otsego county for 25 years, died last Thursday, April 8, at her home in Saginaw following a lingering illness. Mrs. Dreffs left Gaylord 13 years ago and has since lived in Saginaw. Mrs. Dreffs was born in Poland 57 years ago, coming to Gaylord 38 years ago. She leaves to mourn their loss, her husband and ten children, Martin and Vincent of Gaylord; Frank, Walter, Paul, Andrew and Cassimer Dreffs; Mrs. Paul Grabowski, Mrs. Stanley Remyszewski and Mrs. Mary Kolba, of Saginaw; 37 grandchildren and one great-grandchild. Funeral services were held at St. Casimers church at Saginaw, Saturday morning, Rev. Fr. Valerlan S. Szymanski officiating. I would love to see the passenger entry for Anna Dreffs or Anna Kozminska. I am hoping it is with the passenger entry for Joseph Dreffs, which I cannot locate. The death record for Anna has “unknown” listed for the information name and birthplace of both of her parents. 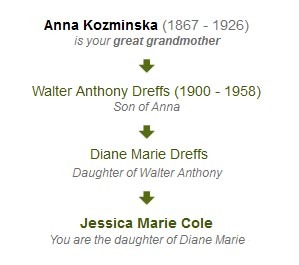 Check out my Ancestry Family Tree for Anna (Kozminska) Dreffs. See the grave of Anna (Kozminska) Dreffs on Find A Grave. This week we take a look at the lineage of the Dreffs surname as it pertains to my family’s history. The Dreffs name has come to be synonymous with BRICK WALL for me. Joseph and Anna spent several years in Gaylord, Michigan which is where their eighth child, my grandfather Walter Anthony Dreffs, was born in 1900. He moved the family to Saginaw around 1910 and lived there until the 1930’s when the family moved to Gilford in Tuscola County. Joseph Dreffs died 20 Dec 1941 and is buried in Mount Olivet Cemetery in Saginaw. Joseph and Anna had eleven children: Martin Dreffs (1887 – 1976), Hattie (Ida) Dreffs (1888 – 1960), the elusive Vincent Joseph Dreffs (1892 – ? ), Jennie Dreffs (1892 – ? ), Veronica (Vera) Dreffs (1894 – 1946), Mary C. Dreffs (1896 – 1973), Francis Stanley Dreffs (1898 – 1959), my grandfather Walter Anthony Dreffs (1900 – 1958), Paul Anthony Dreffs (1902 – 1980), Andrew S. Dreffs (1903 – 1961) and Carl Casimier Dreffs (1906 – 1969). If this tiny lineage isn’t indicative of a solid brick wall, I don’t know what else is. I’ve been heavily researching this line for more than a decade. Unfortunately, my grandfather Walter died when my mother was only six years old. He was somewhat of a drifter, a gambler and an alcoholic; he left no trace of his family history except what little bits I’ve been able to unearth that were documented in his vital records. I wrote to the Polish Genealogical Society of America and asked them to send me information on the Dreffs surname. I received in response a single piece of paper with the following information: “Drefs 8, ToNa: F. 1, PoSz: M. 1, F. 1, PomPo: M. 2, F. 2, SzmSz: M. 1” They included no instructions, so I am assuming that means the Drefs family has a grand total of 8 family members in all of Poland. That’s probably why I am finding the research nearly impossible to conduct for this surname. Looking on their website under the Dictionary of Surnames in Current Use in Poland, I see this surname is found in either Poznań or Szczecin. Given that the Naturalization papers for Joseph say he is from “Posen” I have to assume he came from the province of Poznań. My grandfather Walter Anthony Dreffs is missing in action between 1925 when he is listed in the Saginaw City Directory and 1941 when his father’s obituary lists him as living in Saginaw. I can’t find him at anywhere, including the 1930 US Census. We believe he may have had another family somewhere during this time. 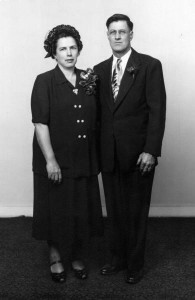 Walter returned to Saginaw after his father’s death and began having children with my grandmother, Mary Rose (Stroik) Karpuk. The couple had eight children together – two single births and three sets of twins. Only six of their eight children survived. The middle set of twins died at birth. If you look at the wedding portrait for Mary and Walter you will notice that she is 8 months into her final pregnancy with my mother Diane and her twin brother, Daniel. They had their first six children out of wedlock. 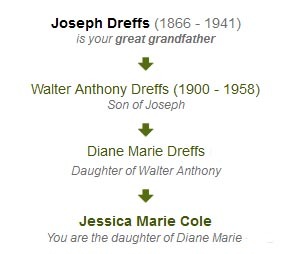 The Dreffs family has been my biggest brick wall throughout my first decade of genealogical research. I am desperately seeking Joseph Dreffs’ passenger ship record. I am forever looking for Walter Anthony Dreffs in the 1930 US Census. Did he have another family before he got together with my grandmother? They knew each way back in the 1920’s but didn’t hook up until 1941. I can’t WAIT for the 1940 Census to be released in April 2012. Grandpa – I WILL FIND YOU! Check out my Ancestry Family Tree for Joseph Dreffs. See all of the Dreffs graves I have posted on Find A Grave. 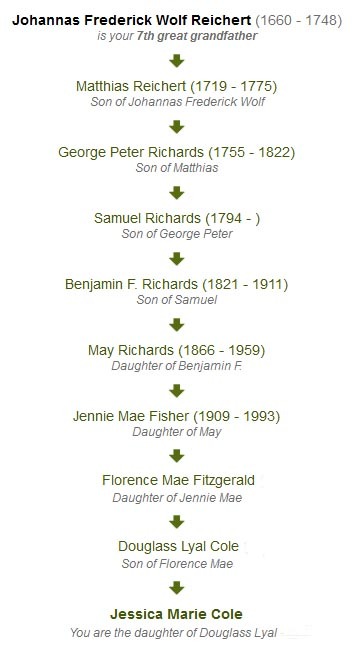 This week we take a look at the lineage of the Richards surname as it pertains to my family’s history. My 3rd great-grandfather was Benjamin F. Richards. Benjamin was born 14 May 1821 in Kentucky, and died 18 Jan 1911 in Eagle Creek Township, Lake County, Indiana. He married Ann (nee Henderson or Smith) around 1858 and the couple had two children that survived to adulthood: Francis “Frank” Richards (1861 – 1936) and my 2nd great-grandmother, the lovely May Richards (1866 – 1959). The general Fisher research community seems to agree that the line goes back to Johannas Frederick Wolf Reichert who was 1660 in Augsburg, Wurtenberg, Germany. He brought the family to the USA and died in 1748 in New Hanover, Montgomery, Pennsylvania. Johannas would be my 7th great grandfather. However, I have not done the research to prove this line fully. Benjamin and Ann Richards are listed on the 1910 US Census, Eagle Creek, Lake County, Indiana (ED 43, Sheet 4B, Lines 64-65). Benjamin is 90 years old and his wife Ann is 82. They have been married for 52 years, and had five children but only two survived. Curiously, he is listed as being born in Ohio and his parents in “The United States.” She is born in Ohio while her father was born in Vermont, and her mother in Tennessee. I am very intrigued by the words under Benjamin’s occupation: “Own Income.” Was he independently wealthy? Very interesting. I’d like to locate the three children of Benjamin and Ann Richards that did not survive that are listed on the 1910 Census. In a letter from Harold Richards to my father Douglass Cole dated April 30, 1982, he said that he thinks Benjamin and Ann may have had a baby girl that died young. I’d like to locate the graves for Benjamin and Ann Richards. Check out my Ancestry Family Tree for Benjamin Richards.